Saturday sees new beer and lots of chicken at 2 Crows Brewing Co.
Luke Gaston has a thing for fried chicken. Highwayman’s chef started developing his recipe in 2010 when he was working at Toronto’s The Healthy Butcher—a recipe he’s happily been tweaking and evolving since. This weekend he’s taking a break from his usual Barrington Street post and taking over 2 Crows Brewing Company (1932 Brunswick Street) for the second installment of his pop-up tribute to the always crunchy, sometimes sticky, probably-gonna-need-a-napkin dish. 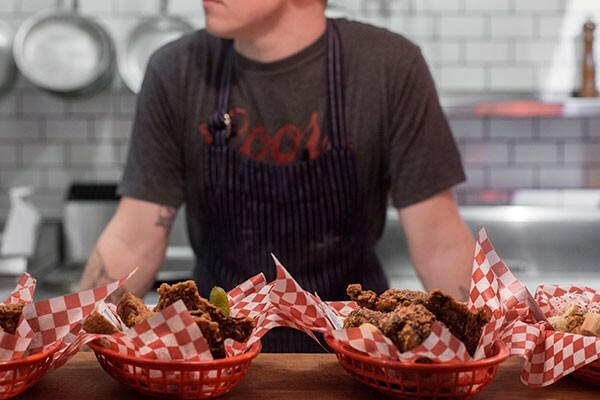 On Saturday (September 8) Luke’s Fried Chicken will serve up its southern-inspired menu—think classic fried and Nashville hot chicken and a selection of sides—at the brewery. It’ll coincide with the release of 2 Crows’ newest brew Perfect Situation, a smooth and juicy New England-style IPA with hints of pineapple, passionfruit and papaya. The fun starts at 2pm and ends at midnight, or after you eat every last drumstick.